There are several Michael Jackson greatest-hits compilations out there, each one its own take on what should be the definitive portrait of the gloved one's career. The Ultimate Collection, The Essential Collection (different from the one here), and Number Ones have all surfaced in 2003 and 2004, and HIStory a few years prior. Each one of these collections, while commendable in its attempt to thoroughly document Jackson's accomplishments, has fallen woefully short in one aspect or another. This has finally been rectified with this installment of Sony's outstanding Essential collection. 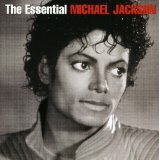 Starting with his campaign with his brothers in the Jackson 5, this two-disc set tours through every important single and every important fan favorite short of including his duet with Paul McCartney on "Say Say Say" (the Beatle does, however, make an appearance here on "The Girl Is Mine"). From Off the Wall to Dangerous, it's all here in one concise package, making it the ideal reference point from which exploration into his deeper catalog can begin. While die-hard fans will already have every single song contained herein and may be weary to purchase another greatest-hits compilation short of a greatest-hits compilation including his backing vocals on Rockwell's "Somebody's Watching Me," this may be the only one fans and casual listeners will ever have to purchase to get their fill of the King of Pop's magic.